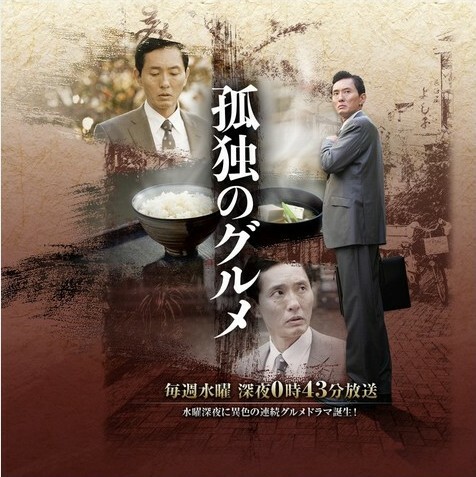 Kodoku no Gurume (Tokyo TV, Winter Edition 2012) or "Solitary Gourmet" is a live action drama adaptation of the manga by Qusumi Masayuki (story) and Taniguchi Jiro (art). There are two main stars in the drama. One is Matsushige Yutaka as Inogashira Goro, a private merchant who personally runs his imported dry goods business on his own. Being a man of a few words, he prefers to live an uncomplicated, solitary lifestyle. He smokes but doesn't drink alcohol. He also has a very healthy appetite. The other star is the food. In between meetings with clients in various towns, Inogashira-san makes it a point to visit different eateries, try out their tasty dishes, and discover the best way to eat them. These eateries are real places in Tokyo serving the actual food featured in the drama. A bonus mini-segment at the end features manga author, Qusumi visiting these places and interviewing their real owners. Final Episode: "Okinawa Soki-Soba and Agu Pork Broiled in Natural Salt of Nakameguro, Meguro Ward"
Episode Synopsis. For the last episode, Inogashira-san meets an unusual-looking married couple on his way to an appointment. However, he realizes that he had missed his lunch so he grabs a quick bite along the way. He then goes to meet with the young pretty owner of a pre-used clothes shop in Nakameguro. Afterwards while strolling around town, he winds up in a street filled with restaurants offering varied menus. He decides to try out an Okinawa-themed restaurant called "SokaBokka..." for a delightful tropical island feast. Ep. 11: "Extra Spicy Curry Rice at a Nomiya (Tavern) in Nezu, Bunkyo Ward"
Ep. 10: "Ginger Pork Rice Bowl with Fried Egg of Higashi-Nagasaki, Toshima Ward"
Ep. 9: "Hiroshima-Style Okonomi-yaki of Shimokitazawa, Setagaya Ward"